This evening we did some telemetry decoding. 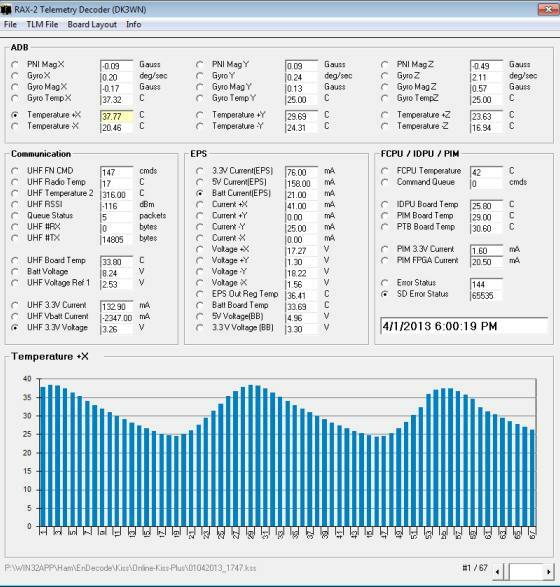 First CubeSat we gave a try was STRaND-1, but it wasn’t sending any data this evening (April 1, 2013 17:50 UTC). When I looked at the Satblog from DK3WN it seems that STRaND-1 wasn’t heard the whole day. Lets hope noting is wrong with the CubeSat. 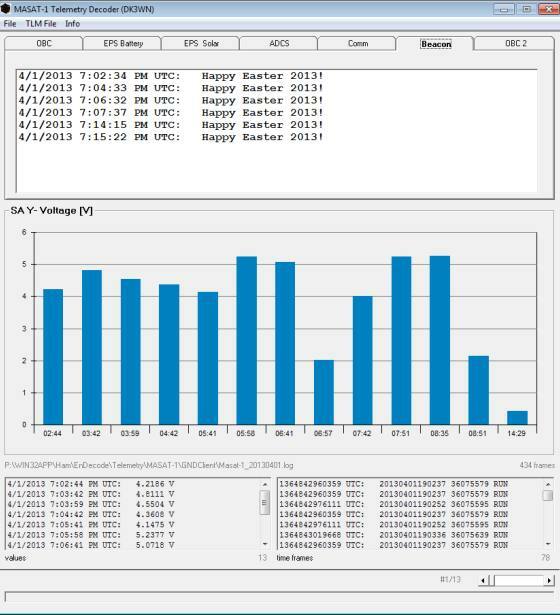 RAX-2 is sending telemetry loud and clear, and the combination FUNcube Dongle Pro+, Orbitron and SDR# are doing a great job in controlling Doppler thanks to a great Doppler control plugin that can be part of SDR#. RAX-2 is sending every 20s a 9k6 data burst that can be decoded with the decode software from Mike DK3WN. During this pass I received over 60 packets and in the below image you can see the results. Here is an example of a KISS frame that is received from RAX-2, nice to see the error that RAX-2 is using RAX-1 as Call. 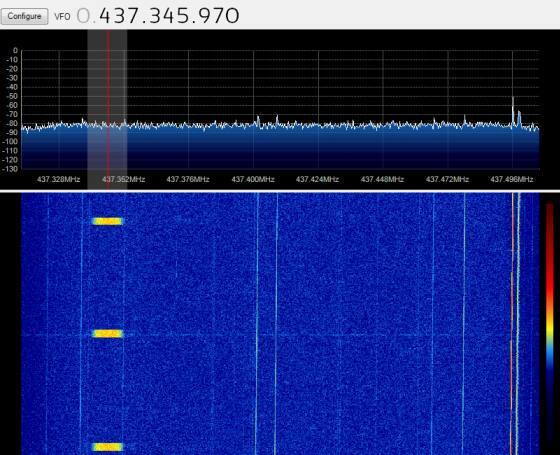 This signal can be decoded with the telemetry software that is available on MASAT-1 website. After that you can use the log file with a decoder program from DK3WN and this produces the following output. When you want to experiment with receiving telemetry, take a look at my soundcard page and give it a try. 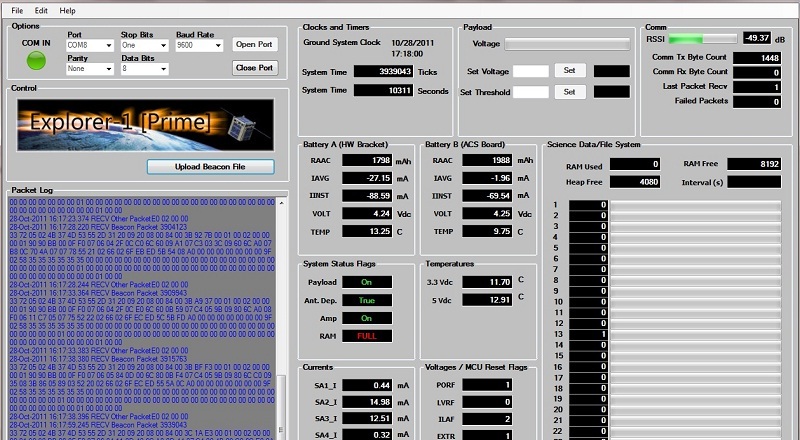 A good explanation from DK3WN on how to determine what TLE data belongs to what Satellite. Based on the latest cubesat TLEs we have now three groups of objects (B+C+D, E, F+G). The first group are the 1U cubesats – they are only a few km apart. In 13 sec distance is RAX-2. I think F and G are the DICE sats. A simple way to determine the TLE, Take one beacon frequency – in this case 437.435 MHz (belongs to RAX-2). Then I calculated all the doppler frequencies for all objectes on a high 66 deg elevation pass. If the doppler = 0 then we have TCA. In this way you can calculate the distance between the TCA of each satellite. Take a look at the spectrogram – the horizontal yellow line is the center frequency of 437.345 MHz and the vertical one is the calculated time for RAX-2. And as chance would have it – we have a packet there. If you take the middle frequency of this 9k6 packet -> it all comes to one point. During the second passage there where again signals from E1P-U2 and because we now switched to LSB modulation, we heard recognizable signals. These where decoded with the use of MixW and the Explorer-1 telemetry decoding software by G3VZV. We now know that there are two active satellites which were launched this morning. E1P-U2 Explorer-1 [PRIME] and RAX-2 both are received.